The view from the third, fourth, fifth, and sixth floor windows of the new Center for Student Services is spectacular, offering a panorama of the brownstones along Bay State Road and glimpses of the Charles River glinting in the background. And it’s about to get even better. 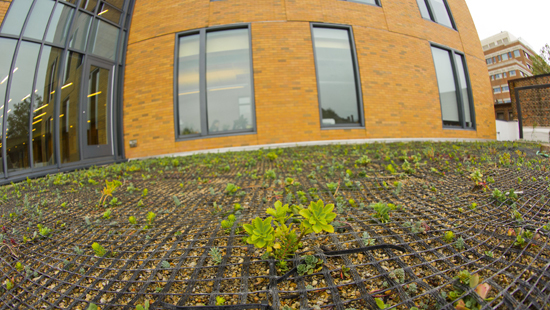 The University recently installed its first green roof, which sits atop the area known as the Ellipse and an adjacent rectangular section on the second floor. Spanning nearly 6,000 square feet, the roof will eventually become a lush, multicolor bed of vegetation that will also decrease the building’s carbon footprint. Installation, which took several weeks, occurred during the building’s final phase of construction this summer and was orchestrated by architects Bruner/Cott & Associates, landscape architects Richard Burck Associates, Bond Brothers contractors, green roof designers Roofmeadow, and installers Xquisite Landscaping. Workers install the green roof at the Center for Student Services. Most BU buildings currently have black roofs, which absorb the sun’s rays and radiate them back into the environment, increasing the overall temperature in the area by as much as 20 degrees, according to Dennis Carlberg, BU’s sustainability director. But the University is gradually moving toward more eco-friendly options. He says that 16 percent of the University’s roofs are now covered in white membranes, which reflect heat and reduce the amount of energy required to cool the building. Choosing to install a green roof at 100 Bay State Road was an easy decision, despite being a more expensive option. “For one, it has long-term benefits to our sustainability strategy at BU and improving the efficiencies of our buildings,” Meissner says. “And two, it’s the right thing to do.” The feature also increases the likelihood that the building will receive Leadership in Energy and Environmental Design (LEED) certification, which the University has applied for. Green roofs are not only more pleasant to the eye, Carlberg says, they’re also sustainable. They reduce the heat island effect created by black roofs, improve roof insulation—leading to lower heating and cooling bills—and increase rainwater retention, reducing runoff that can overwhelm sewer systems. In fact, green roofs absorb up to 60 percent, or 90,000 gallons, of rainfall each year. “We’ll have a higher quality and a lower quantity of water leaving the site,” Carlberg says. BU’s green roof is layered like an eco-friendly lasagna. A protective white membrane covers the concrete roof. Over that is placed a leakage detection system, then a drainage system, another layer of fabric, and four inches of soil planted with 10 varieties of sedum, a native drought-resistant plant. A mesh-like wind blanket prevents erosion, and surrounding concrete pavers help anchor the blanket. A vine called fiveleaf akebia borders the western side of the roof and is planted in a bed of blue fescue. The roof will require occasional watering and weeding the first year, Carlberg says, but should be self-sustaining after that. I did a capstone project on this…my entire section was a proposal on green roofs and how incredibly beneficial they are to avoid the heat island effect–and how aesthetically pleasing they can be! So SOO happy to see BU has begun to install them on our roofs. I love my school! Sorry to say, no one is allowed on the green roof except its caretakers. It’s a delicate environment and isn’t built for visitors. Who knows, maybe that will be the next BU project. You can’t go out on the roof itself, but you can see the plants fairly well from windows of the higher floors inside the building. I think best spot to see the whole effect of the roof is the 4th floor. The best spot to look closely at the plants is the 3rd floor. Look magnificent doesn’t it? I would have love to have see this develop start to finish. Green roof environmentally protects the building and insulated head much better than traditional roofs, and you can grow your own vegetables. I went to Boston University and ended up starting a couple different businesses. One is a roofing, siding and gutter business. I have been reading about Green roofs on several other blogs and would be interested in offering something like this to my Clients. The positive effects on pollution I’ve read are fantastic! Plus, aesthetically pleasing in an environment full of concrete. I truly believe many of my commercial clients would be interested simply for the benefit of having a longer lasting roof and being able to contribute to providing a greener community. It shows that green roofs are not suitable for to all buildings. But green roof looks very beautiful.